It's October, and that means it's the official start of the South Florida Theatre Season! This year, we've added seasonal listings for both Mainstage theatre productions AND Children's theatre. These features are linked in the Sidebar, and will be updated as more listings become available. Now you can look ahead and plan your theater outings accordingly. Terrence McNally's Some Men is many things, some of them insightful or touching or enjoyable. But a coherent, concise play it is not. OK, so the script needs work, but sometimes, a bad script can be overcome. What does Christine think? With so many settings, eras and characters (each of the eight actors plays multiple roles), it's lucky that McNally thought of using vaudeville-style placards to announce the location and year of each scene. A powerhouse cast with more elaborate sets and costumes might make that unnecessary, but Rising Action isn't blessed with those things. The strongest performance comes from Larry Williams, who plays the closeted married guy, a wealthy '20s Wall Street type who's romancing the family chauffeur and a cheeky British bartender. Williams easily differentiates his characters and simply sets a standard that most of his fellow actors can't achieve. With the loss of Jack Zink at the Sun-Sentinel, and the Palm Beach Post's failure to replace Hap Erstein, Brandon K. Thorp is now the other major voice of theatre review in South Florida. Is it because he's that good? Is it because his paper has become a respected journal? Honestly, no, although he is pretty good, and so are the two papers he writes for. No, it's because I can find his reviews every week. He's either in one New Times or the other, and he's always linked on the home page when his review is in there. Brandon (having a lot of space available to him) starts off with an explanation of sorts; he puts this particular production in context. While I often complain that we get too much backstory, in this case it's justified. ...frankly, few theaters in South Florida are less equipped to interpret his effort than Rising Action Theatre. Rising Action is a new, poor company that draws its actors from a pool of community theater vets, and it's most comfortable with intimate, simple shows with a few carefully chosen players slathered with lots of directorial attention. Some Men is the opposite of that: a nonlinear exploration of love and commitment spanning more than 80 years of American gay life in which every member of a big ensemble must create five, six, seven, or eight distinct characters over the course of 13 fast-moving scenes. It is a beast of a show, and casting it would be tricky for Caldwell Theatre or Florida Stage. At little Rising Action, even the attempt seems masochistic. Got the picture? A new company with limited resources, who are employing not necessarily the best actors, but the best actors they can get. That's not intended as an insult on my part, nor, I believe, on Brandon's. When you don't have a lot of funding, you can't hire the more seasoned (and trained) Union actors found on the region's powerhouse stages. Even though "effort" generally doesn't count for much in the theater biz, you've got to admire how not excruciatingly bad this Some Men really is. That sounds like faint praise, but I'm serious. At no point in Some Men are you likely to lose yourself and forget that you're watching actors acting — but also, it's the rare scene that doesn't contain some pathos or a genuine giggle. It's commendable to see a critic exercising this kind of temperance; critics (and Carbonnel judges) have to sit through a lot of awful theatre. It can lower one's tolerance for theatre at the lower rungs of production value. But Brandon does something we rarely see; context. ...a series of heroic performances from Leddick and some solid ones from four actors I've never seen before: Larry Williams, Larry Brooks, Ted Dvoracek, and Joseph Long. Dissecting their problems would be pointless. Most of the people who would consider going to Rising Action have at least a vague notion of what they're getting into in terms of production values. They come, I suspect, in the knowledge that ignoring a few foibles will allow them to enjoy a handful of genuinely gorgeous moments, and Some Men has one that rivals anything you'll see anywhere. It is set in the aforementioned piano bar near the Stonewall Inn during the riots, and as queens talk about show tunes and Judy Garland (who died that morning), they are interrupted by the sudden arrival of a tottering, attitudinal drag queen, dressed in layers of explosively glittery red, played by Leddick. Rising Action it self is one of the priciest SMALL theatres in town, with a ticket going for $30.00 for just the show and $58.00 for the show and a 3 course dinner at Primavera restaurant. *Does not include sales tax or gratuity*. At these prices one should expect a better production. Some Men plays at the Rising Action Theatre Company in Fort Lauderdale through November 2. One crime, four points of view; the truth itself is a kind of bias. A New York City Police Officer shoots and kills an unarmed sixteen year-old boy. The investigator assigned to the case must wade through prejudice, deceit, and a volley of anonymous threats to find out where culpability really lies. This world-premiere play runs through October 26 in Coral Gables. You can also read about this production at Theatre Row. The musical everyone has been talking about is the Actors' Playhouse production of 1776. And it's not because Ken Clement has been talking my ear off about it for over a year. Folks at the office as well as friends in the blogosphere have been buzzing about this history-set-to -music. It's even been Christine Dolen's Critics Pick for the last two weeks. This Sherman Edwards-Peter Stone musical is not done very often, and as far as I know, this is only the third professional production ever done in South Florida. A perfect cast has been selected; Gary Marachek as the "obnoxious and disliked" John Adams, David Kelley as the quietly intense Thomas Jefferson, and the man most likely to be the reincarnation of Benjamin Franklin, South Florida's favorite character actor, Ken Clement. 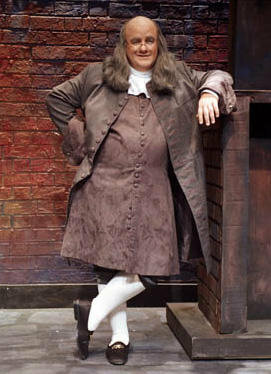 To be fair, Ken has portrayed Doctor Franklin before; he is pictured here in the GableStage production of Citizen Tom Paine. 1776 runs through November 2nd. Don't miss this look at a time when Congress actually did something heroic. Another show opening this Friday is Silent Heroes at the Women's Theatre Project. This is the Southeastern premiere of a play by Linda Escalera Bags (see interview by Conundrum Stages). A plane crash. A midnight phone call. Now six wives of Marine fighter pilots wait to discover whose husband will not be coming home. Set in 1975, this examination of the culture of the military, and particularly the Marine Corps, allows us a look into the behavior and attitudes of military wives who were governed by a code as real to them as the code of conduct by which their husbands so fiercely adhered. Ms. Baggs, a Jacksonville resident, will visit and participate in audience talk-backs in conjunction with this production; contact the theatre for details. Silent Heroes runs through November 26. Vincent, a one-man play about the life of Vincent Van Gogh, opens Friday and closes Saturday at the Cuillo Center for the Arts in West Palm Beach. This is the play that Leonard Nimoy wrote and starred in few years back. This time, Dan DePaola carries the show. Also at the Cuillo Center, Makeover; a Contemporary Fairy Tale is in previews this weekend. It's described as "Nip/Tuck meets Damn Yankees." According to the producer, the Herald described this show as "a melodic gift." But the actual review followed that up with "His lyrics, however, leave much to be desired ... the script is even worse." For whatever it's worth, it officially opens on October 11, so see it now while it's still cheap. er. August Wilson's Radio Golf, closes this Sunday, October 5th at Mosaic Theatre. An imperfect production of a playwright too rarely staged in South Florida, two out of three critics recommend this play. Do Black Patent Leather Shoes Really Reflect Up? also ends its run at the Stage Door Theatre this Sunday. The FIU Theatre Department production of Eduardo Machado's The Cook closes this weekend. THE SCENE doesn't usually promote university plays, but this Cuban playwright is very rarely produced, even in South Florida. Sesame Street Live opens this weekend, but it only runs this weekend at the Broward Center for the Performing Arts. It's a romp with Elmo and all his Sesame Street Friends.